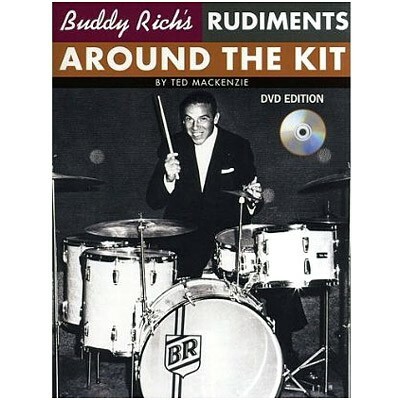 Buddy Rich – Rudiments Around the Kit Book/DVD – In 1942, Buddy Rich collaborated with Henry Adler, publishing Buddy Rich’s Modern Interpretation of Snare Drum Rudiments. It is known today as “the drummer’s bible.” In 2005, Ted MacKenzie revised the classic snare drum book and, with Henry Adler’s blessing, revealed the method behind the book. In this book, Ted takes Buddy’s rudiments from the original book and carefully applies them to the drum set. There is no favoring of the downbeat in any of the rudiments, allowing the student to gain confidence and control while developing a natural vocabulary around the kit. Combined with MacKenzie’s The Ultimate Drummer’s Workout DVD, this comprehensive program is the fastest, most efficient study ever put together for gaining proficiency and fluidity around the kit. Softcover Book approx. 9″ x 12″ and 128 pages.